We would like to thank each of our sponsors for their generous support - as without them this event would not be possible. PRA Health Sciences is a full service global contract research organization, providing specialized expertise across all phases and therapeutic areas of clinical development. We offer a broad spectrum of service models and solutions to pharmaceutical and biotechnology companies around the world - including but not limited to data management, statistical analysis, clinical trial management, and regulatory and drug development consulting. Our global operations span more than 70 offices across North America, Europe, Asia, Latin America, South Africa, Australia, and the Middle East, and more than 16,400 employees worldwide. Since 2000, we have participated in more than 3,800 clinical trials worldwide, assisting in the pivotal or supportive trials that led to more than 85 products receiving U.S. Food and Drug Administration or international regulatory approval. To learn more about PRA, please visit [www.prahs.com]. 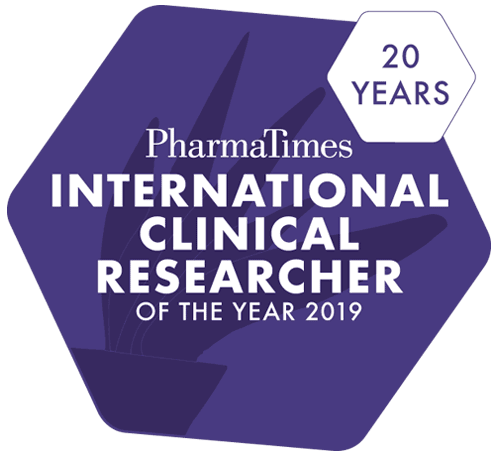 PPD is delighted to sponsor PharmaTimes International Clinical Researcher of the Year 2018. PPD is a leading global contract research organisation providing comprehensive, integrated drug development, laboratory and lifecycle management services. Our clients and partners include pharmaceutical, biotechnology, medical device, academic and government organisations. With offices in 48 countries and more than 20,000 professionals worldwide, PPD applies innovative technologies, therapeutic expertise and a firm commitment to quality to help clients and partners bend the cost and time curve of drug development and optimize value in delivering life-changing therapies to improve health. We represent innovative biopharmaceutical companies in the UK. Our industry, a major contributor to the economy, brings life-saving and life-enhancing medicines to patients. We represent companies who supply more than 80 per cent of all branded medicines used by the NHS and who are researching and developing new medicines, ensuring that the UK remains at the forefront of helping patients prevent and overcome disease. The ABPI also negotiates for the branded pharmaceutical industry in statutory consultations, including the pricing scheme for medicines in the UK. help develop the people who conduct and contribute to applied health research. ICON plc is a global provider of drug development solutions and services to the pharmaceutical, biotechnology and medical device industries. The company specialises in the strategic development, management and analysis of programs that support clinical development - from compound selection to Phase I-IV clinical studies. With headquarters in Dublin, Ireland, ICON employed approximately 13,670 employees in 89 locations in 37 countries as at December 31, 2018. Further information is available at www.iconplc.com.